Does your headwear need to comply with any safety regulations? At Life-Gear we offer different types of safety helmets that should keep your head, face, eyes and ears protected at all times. Continue reading if you want to find out what different types of safety helmets we offer. Bump caps such as this ERGODYNE Short Brim Bump Cap, are perfect for protecting your head from minor bumps and bruises. This cap is fitted with a hard removable shell to protect you from falling objects and is foam lined for comfortable wear all day. This also cap complies with EN 812 regulations. 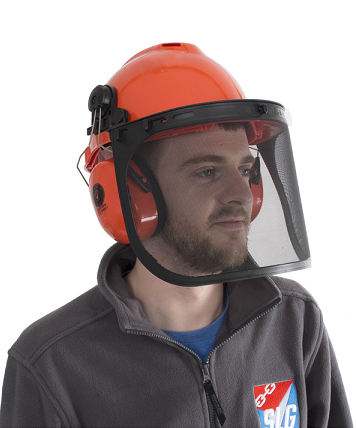 We think this is the perfect cap to wear on site, even if no lifting tasks are ongoing - you can never be too safe! This Life-Gear Forestry Helmet set is perfect for protecting your head, ears and face from falling objects or fragments of wood as you carry out your forestry tasks. It is incredibly easy to use and adjust, making it safe and comfortable for prolonged use. The visor and earmuffs can be detached or attached to the main helmet depending on the type of protection you require. If you have any questions about the different types of safety helmets we stock, or if you'd like to purchase one over the phone then don't hesitate to contact us on 0117 9381 600. We look forward to hearing from you!